Cory Churches is a Communication and Outreach Specialist in the Office of Public Affairs within the International Trade Administration. This week we’ve launched World Trade Week with the President’s Proclamation and we are hard at work highlighting the opportunities, successes, and innovation surrounding trade and exporting. 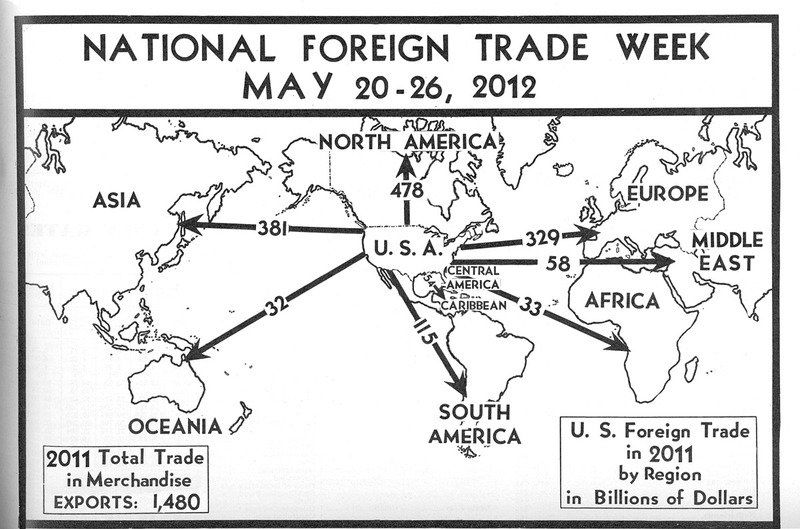 This map is patterned on the 1940 National Foreign Trade Week (May 18-24) updated to reflect 2011 trade figures for exports of merchandise. In the past 50 years, U.S. exports have expanded 80-fold from $26 billion in 1961 to a record $2.1 trillion last year. It is our mission here at the International Trade Administration to continue that trend by working to expand opportunities for businesses of all shapes and sizes, helping them connect with more international buyers, and opening new markets for the great products and services we innovate and manufacture here at home. Just this year, the trade agreements with South Korea and Colombia have been implemented and U.S. companies are now reaping the benefits and enjoying potential growth in exports to those countries. We recognized 41 U.S. companies and organizations last week with the “E” and “E-Star” Award and these are just a few of the hundreds of success stories we see each year. Through our world-class foreign and domestic commercial service officers in over 100 U.S. cities and more than 70 countries. And through partnerships with organizations and entities such as the National Association of Manufacturers, UPS, the U.S. Postal Service, FedEx and DHL Express. Your success is our success and we have many ways for you to keep up to date on the most important changes in rules and regulations impacting your business, find out about trade event opportunities and provide feedback on how we’re doing. Our monthly newsletter International Trade Update is issued on the first Tuesday of every month and will keep you on track and in the know. You can also find us on Facebook and twitter.